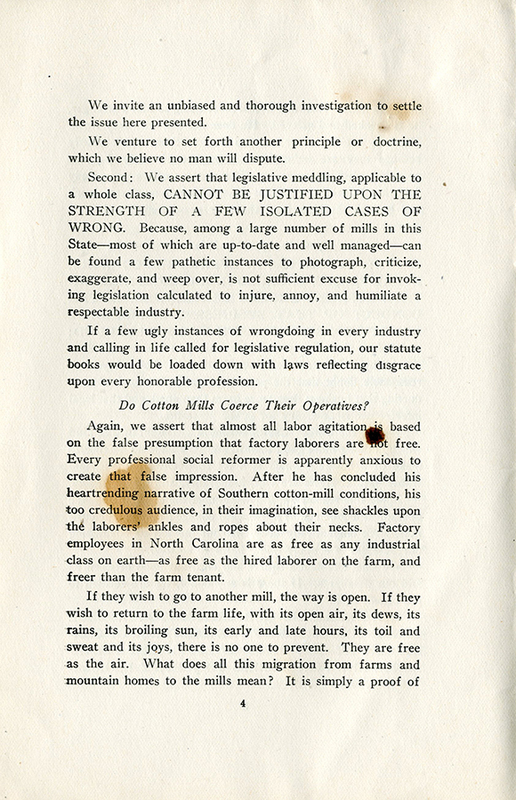 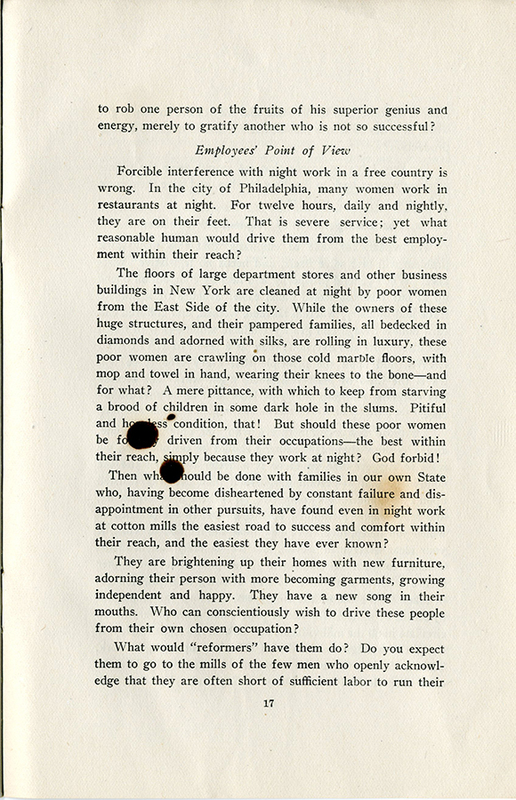 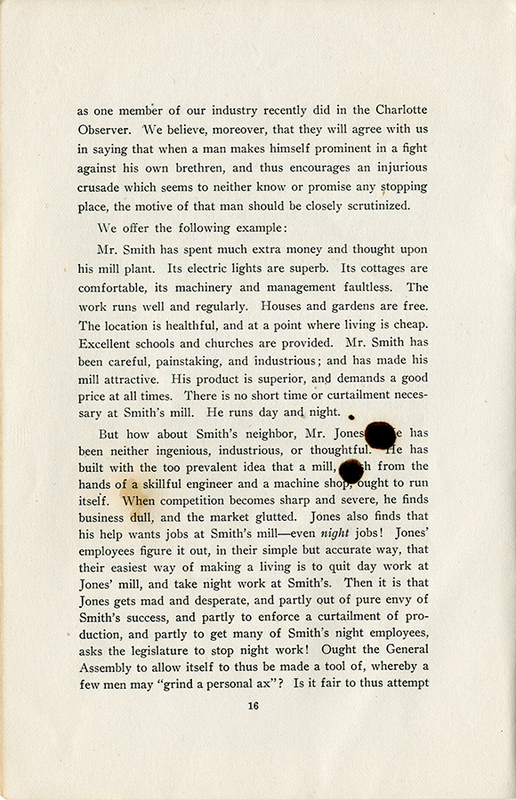 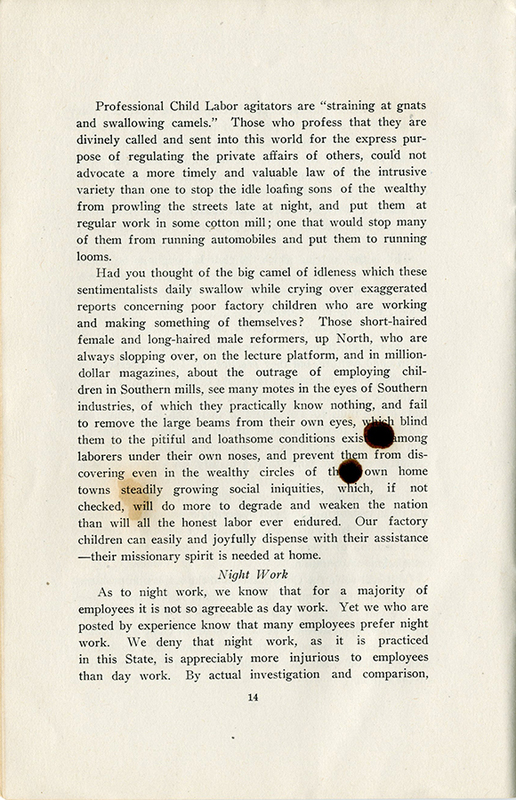 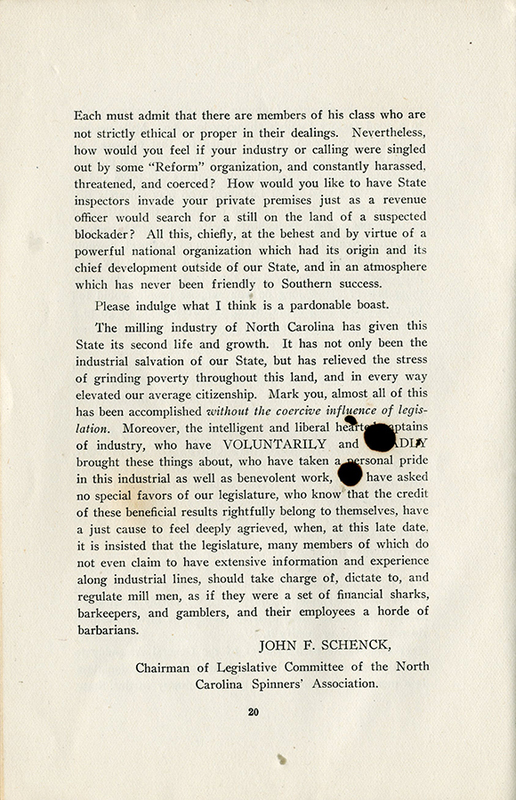 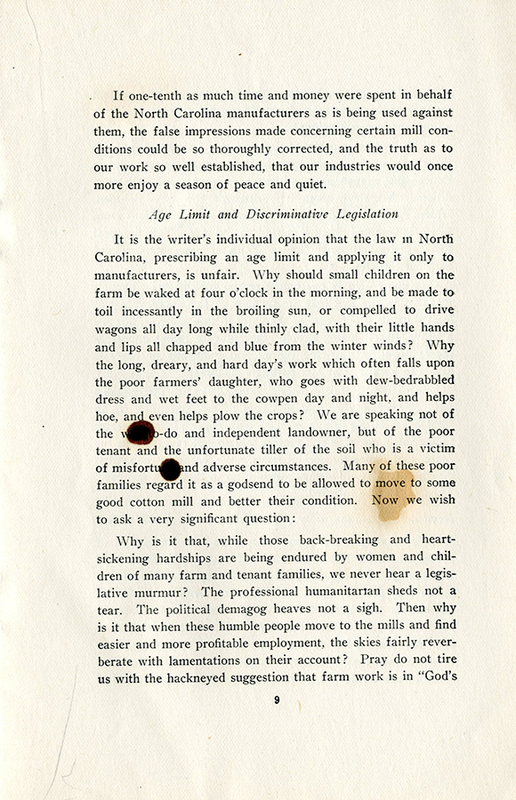 Pamphlet by John F. Schenck, Chairman of the Legislative Committee of the North Carolina Cotton Manufacturers' Association, arguing against legal protections for child workers in cotton mills and other Southern industries. 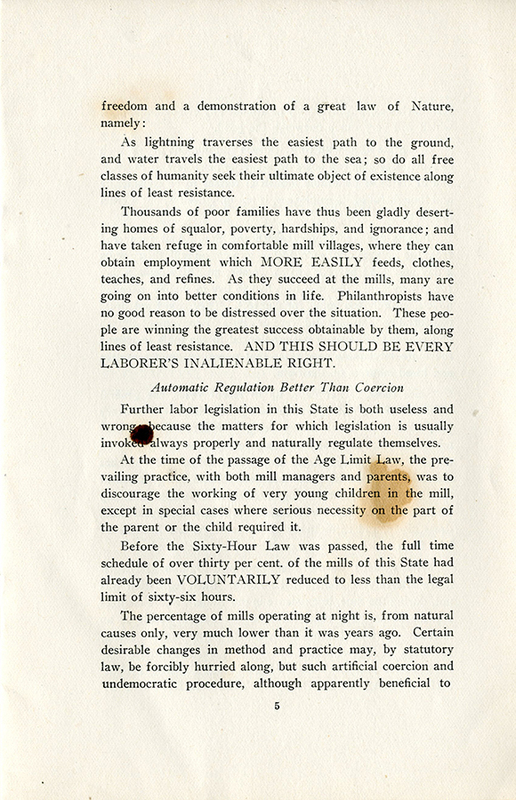 p. 6-7 "UNTRAMMELED AND WHOLESOME COMPETITION AMONG THE MANUFACTURERS THEMSELVES HAS AMELIORATED THE CONDITIONS OF TEXTILE LABORERS, AND ADDED MORE TO THEIR WELFARE IN THE LAST TWENTY-FIVE YEARS THAN LABOR LEGISLATION CAN EVER ACCOMPLISH, BUT NOT A WHIT MORE THAN A LITTLE HASTY AND UNCALLED-FOR LEGISLATION CAN UNDO." 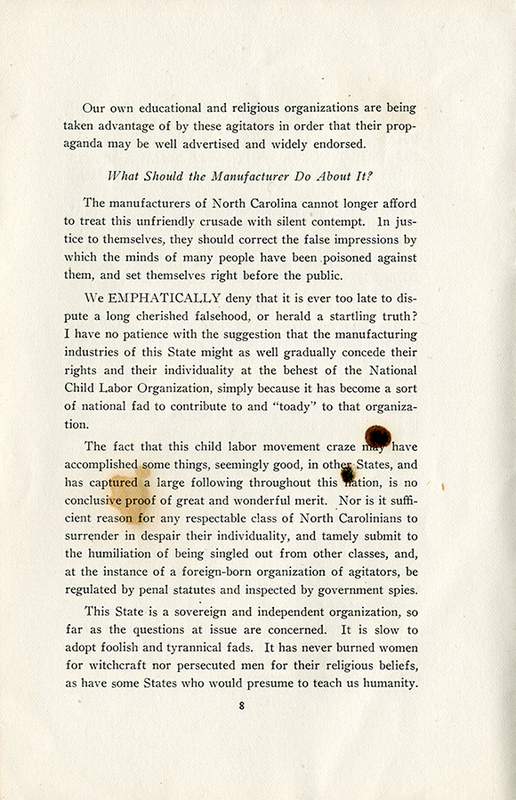 p.8 "The fact that this child labor movement craze may have accomplished some things, seemingly good, in other States, and has captured a large following throughout this nation, is no conclusive proof of great and wonderful merit. 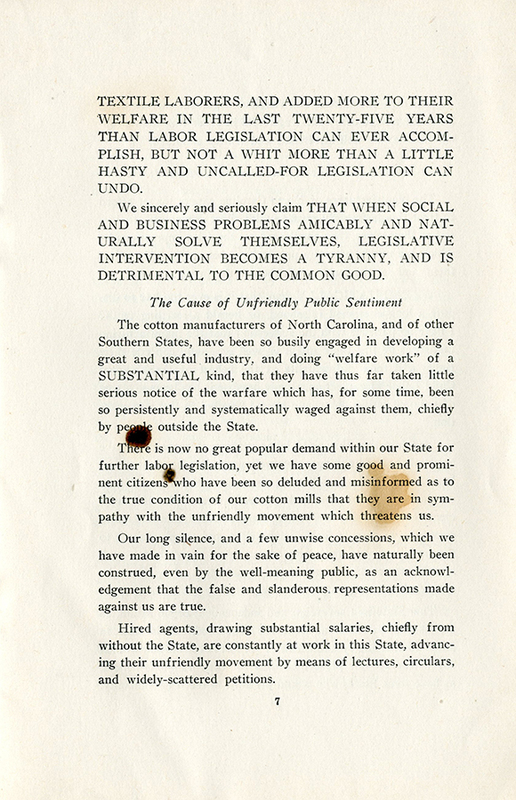 Nor is it sufficient reason for any respectable class of North Carolinians to surrender in despair their individuality, and tamely submit to the humiliation of being singled out from other classes, and at the instance of a foreign-born organization of agitators, be regulated by penal statutes and inspected by government spies. 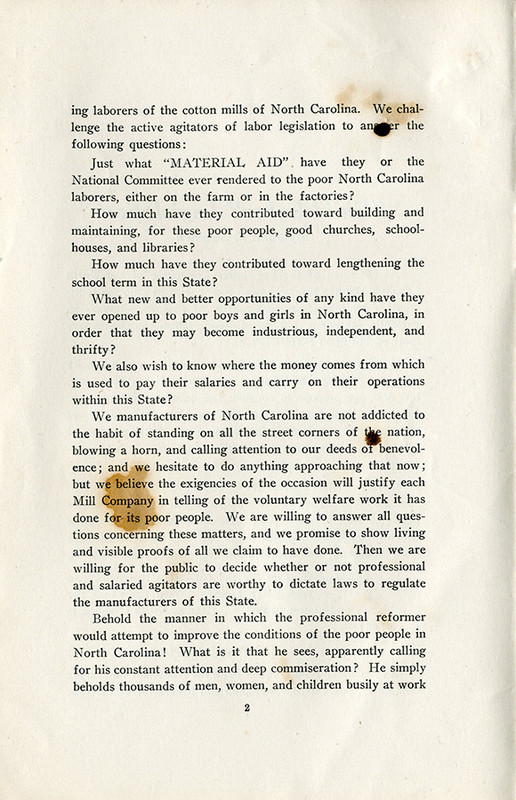 This State is a sovereign and independent organization , so far as the questions at issue are concerned. 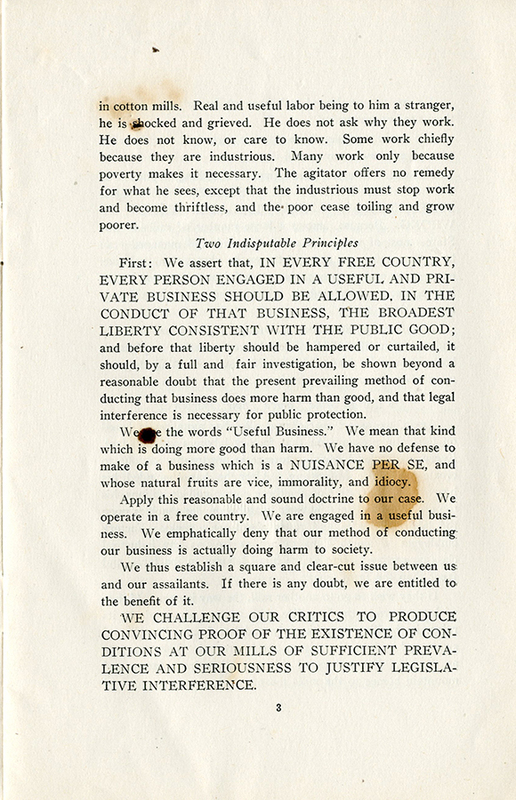 It is slow to adopt foolish and tyrannical fads. 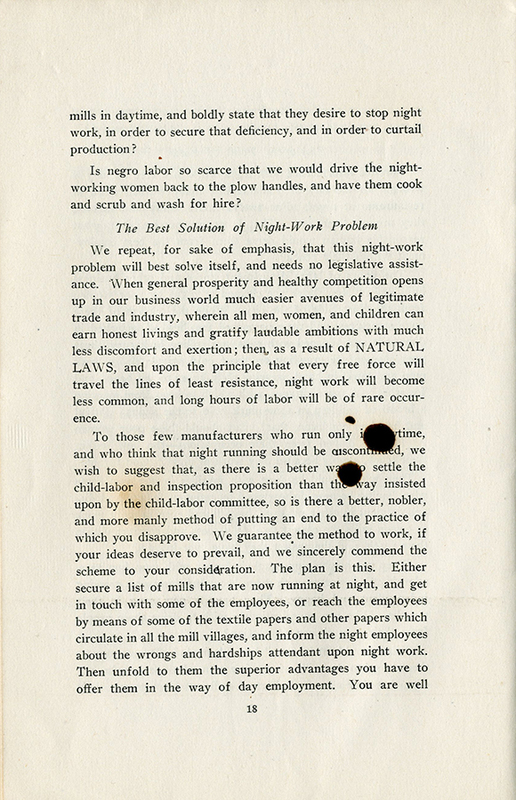 It has never burned women for witchcraft nor persecuted men for their religious beliefs, as have some States who would presume to teach us humanity." 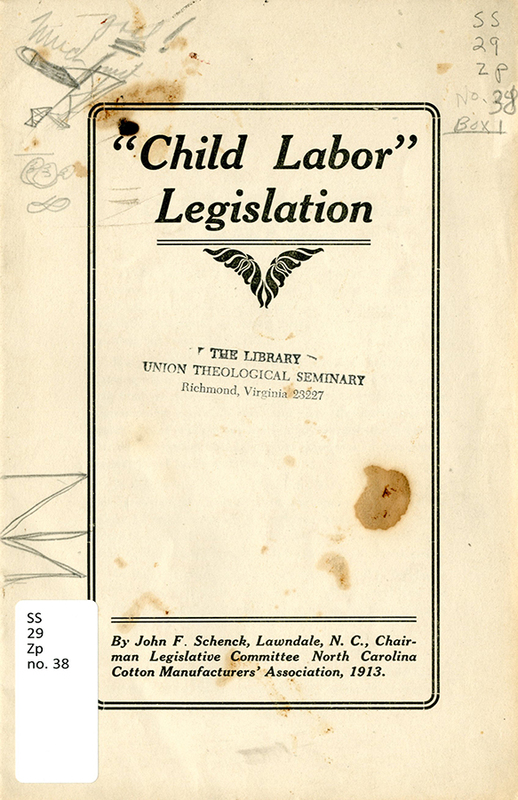 p. 12 "The doctrine that children should not labor is new; and practical men do not believe a word of it." 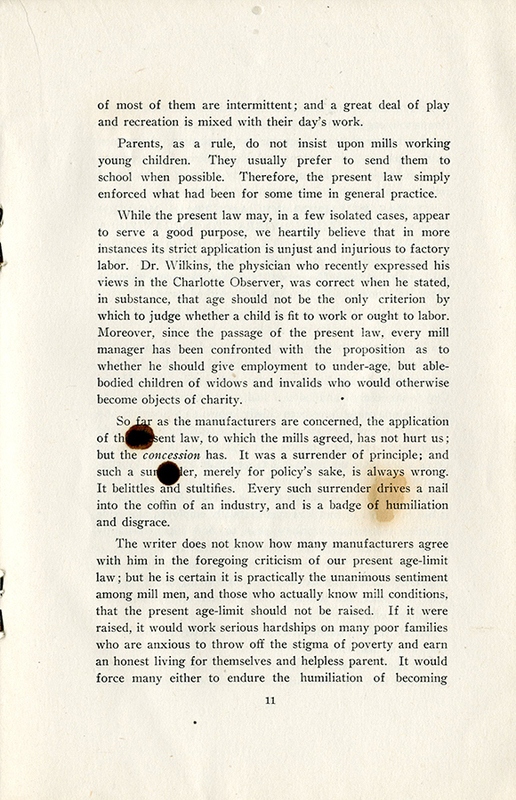 p. 13 "The manufacturers of this State not only profess an interest in child welfare, but the practice it. 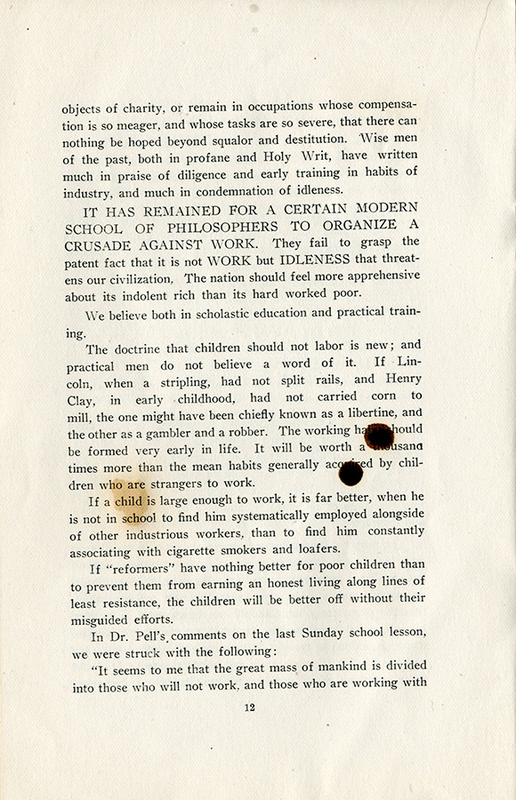 They are epecially interested in the educational idea. 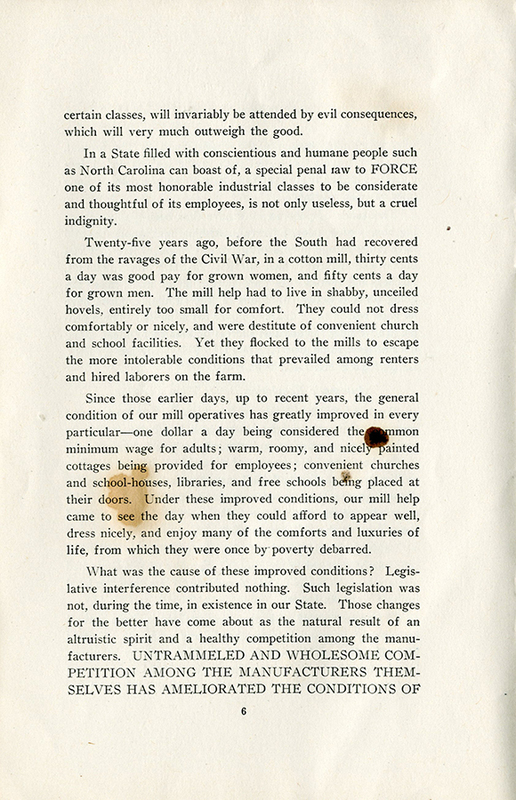 As evidence of it, we point to the excellent schools which are built and maintained by most of the mills for the benefit of their employees' children and espcially to the resolution of our last Spinners' Association endorsing Compulsory Education. 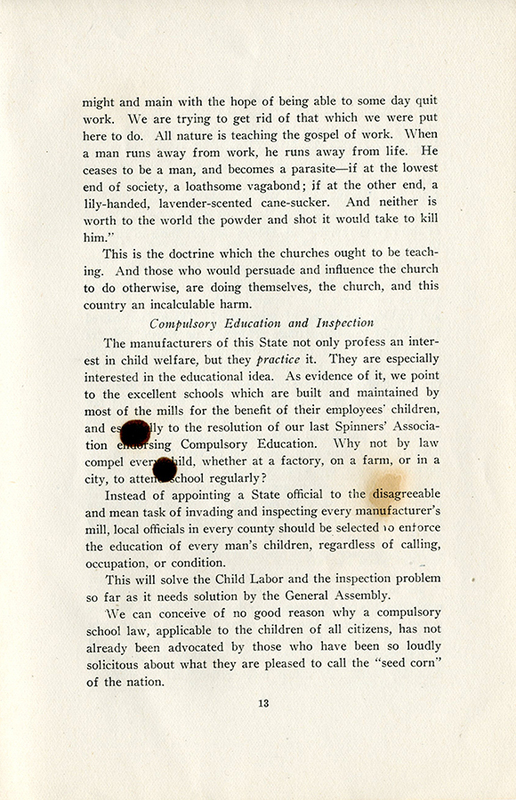 Why not by law compel every child, whether at a factory, or on a farm, or in a city, to attend school regulary?" 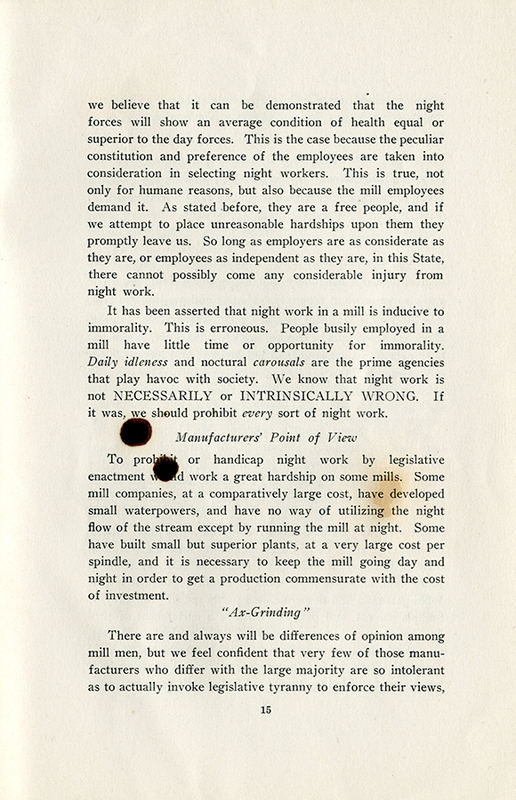 Dawley, Thomas Robinson (c.1912). 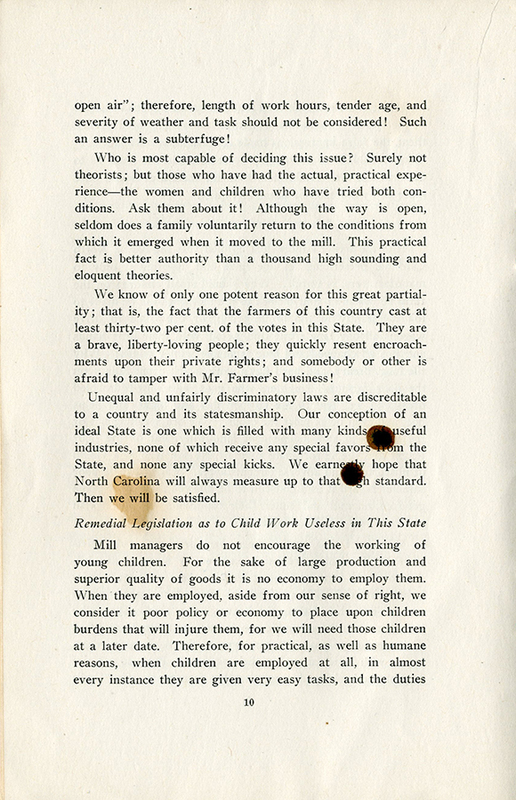 The Child That Toileth Not. 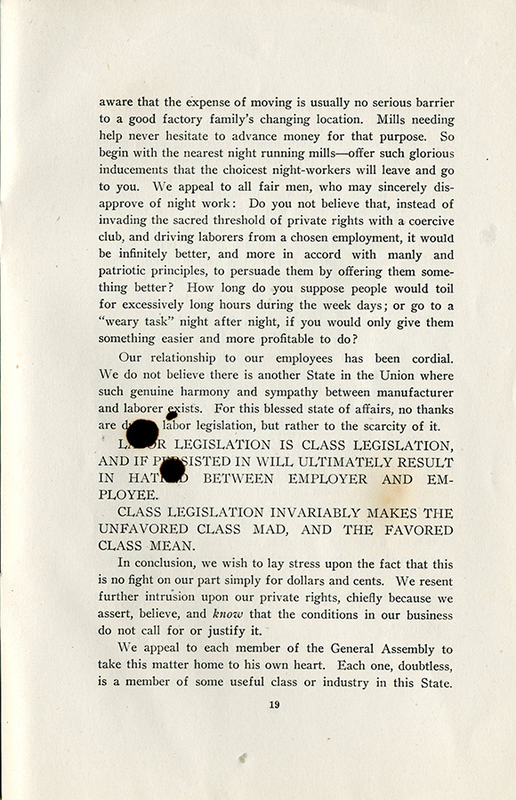 Harvard Library. 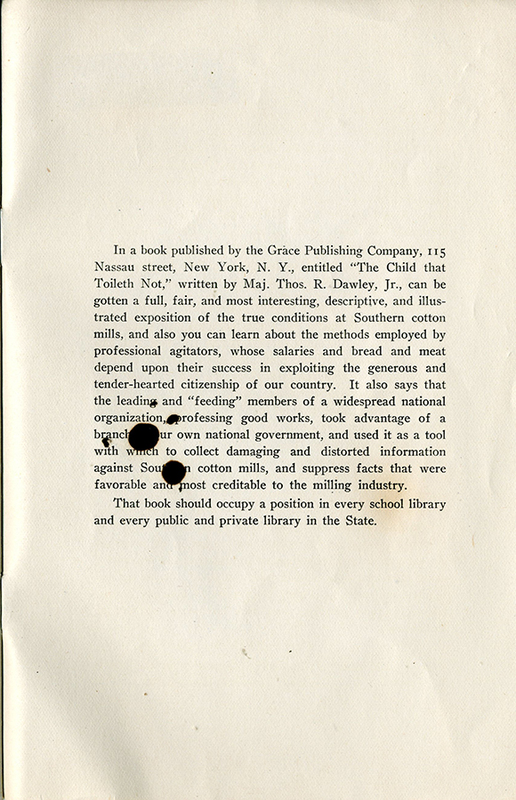 Open Collections Program. 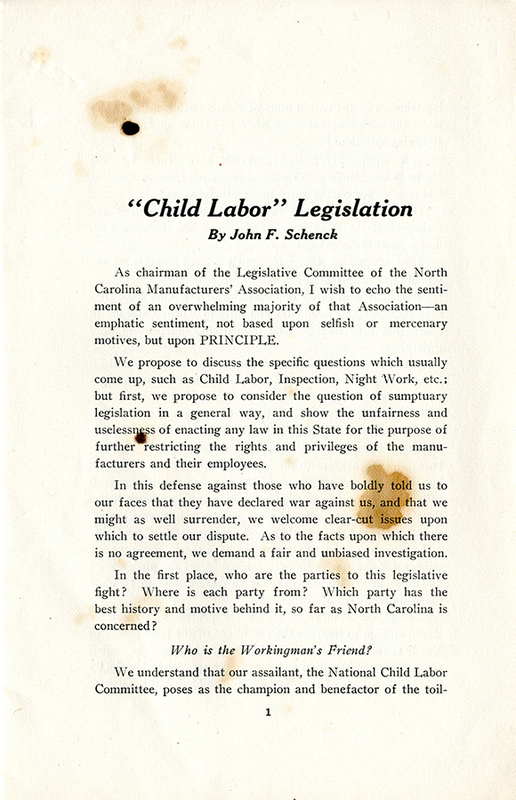 Schenck, John F. (John Franklin), 1865-1945, “"Child Labor" Legislation [Anti- Child labor legislation pamphlet],” Social Welfare History Image Portal, accessed April 26, 2019, https://images.socialwelfare.library.vcu.edu/items/show/325.